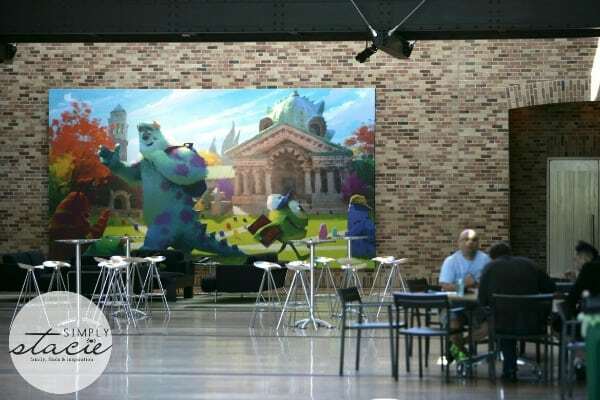 Pixar Animation Studios is the ideal work environment for individuals who are filled to the brim with creativity. Rather than being cramped and industrious, the interior of Pixar is brightly lit, wide open, and inviting. Considering that each feature film takes a minimum of four years to complete, a building that makes its employees as comfortable and at home as possible is a necessity. Just outside the front entrance of Pixar Animation Studios, visitors might notice a soccer field and off in the distance a swimming pool (and yes, it was actually in use when I walked past it on our tour of the grounds)—there is also a basketball and a volleyball court. Employees are encouraged to use them throughout the day to stay healthy; it’s especially important since so much of their work involves sitting in front of a desk or working on a computer. Some employees may even have come up with their most creative ideas while being active outside of their offices. Pixar Animation Studios looks much the way I remembered it from touring it in April 2012 for Brave. What changed, however, is the decor in the atrium (banners for each of the sororities and fraternities that participated in the Scare Games), the artwork on some of the walls, and the large concept art piece hanging on the far back wall of Mike and Sulley from Monsters University, which will be in stores on Blu-ray/DVD on October 28, 2013. One wall in the studio is completely covered in concept art. These are the rough drawings of the artists, often sketched only in pencil and sometimes with a little bit of water color, which are used to simply convey a plot point or mood. These drawings are located at the top of the stairs, which lead to many of the offices of the Pixar employees. For the best view of the concept art, it’s recommended to stand at the top of the stairs. From here, one can see the scenes that with night settings, day settings, indoors, or outdoors. They are placed here to communicate with all of the employees what is going on in the story process. In the beginning, the script is constantly changing and it isn’t possible to keep sending out the updated script to everyone. What better way to keep everyone informed than with visuals? One can quickly interpret the entire story with the board of pictures. 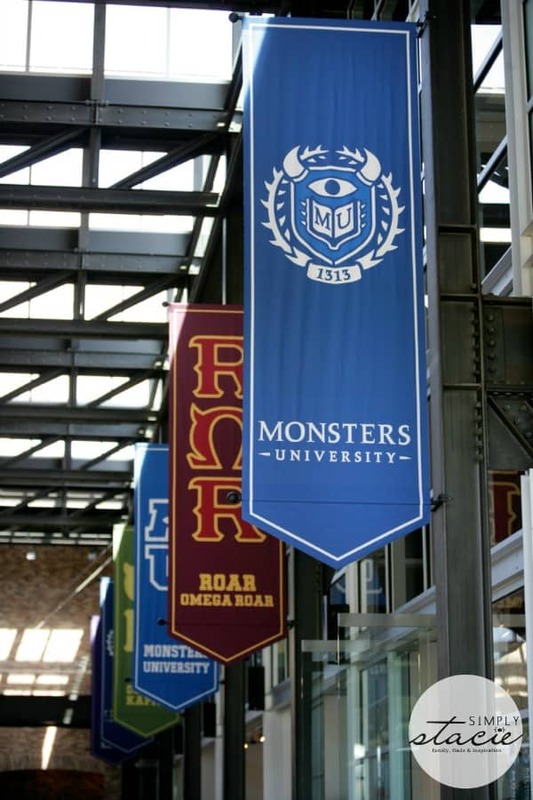 In Monsters University, Sulley attempts to fit in with the In Crowd by kidnapping the mascot of a rival school. The story behind the Scare Pig’s creation is that Dan Scanlon (director) drew a picture of his dog, a pug, and brought it to work. From there, other artists began to tweak the drawing until eventually the Scare Pig became as we know it in the film. They didn’t strictly want the character to be a dog or a cat—they wanted something more fitting of a monster world. Did you know that Dean Hardscrabble was originally going to be a male slug-like character? 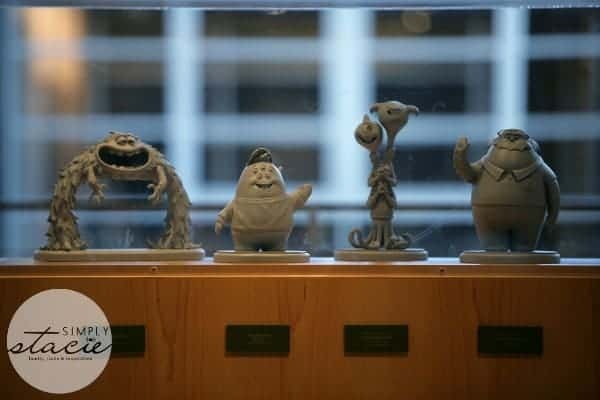 I didn’t until I saw the 3D resin sculptures of him that are enclosed in a glass case in one of the Pixar hallways. The original Dean Hardscrabble wasn’t scary enough, so the artists began to think about what really scared them. Centipedes are scary, and their bite can be harmful to humans. Who isn’t grossed out by their many legs? A live centipede was brought into the studio for the artists to study and sketch; the legs were a challenge for the animators. They had to hand animate, then simulate, and then hand animate over the cells again for a realistic look. There is a hallway in Pixar that depicts artwork unrelated to Pixar projects. The majority of Pixar employees have so many artistic talents that they pursue outside of the gates of the studio. One of my favorites was hearing about a photographer who wanted to get a shot of penguins diving. He waited underwater for three hours in a wetsuit just to get that shot. Employees are allowed to individualize their cubicles. One employee loves Christmas so much that he painted his walls with red and white stripes like a candy cane. Just walking through the halls, we could see little glimpses into the cubicles. They are decently sized and can fit a small couch and sometimes even a small table with stools. In many cubicles, artwork hangs on the walls and toy collections sit proudly on shelves and desks. Before finding her place at Pixar, our tour guide had worked at several various companies in the computer field. She works in tech support at Pixar writing code all day long, and described herself as the geekiest person in the room. What you’d never guess about her is that she has a degree in Russian literature. She very much relates to young Mike in Monsters University; he sets out with the dream of being a Scarer, but as we know from watching Monsters Inc., that career doesn’t work out for him (instead, he’s a scare coach). The film really speaks to her, because like Mike, she had to reinvent herself. Many of the people we talked to at Pixar on this day felt very close to Mike and his emotional journey of trying for a dream, failing at it, and discovering where he really belonged. Wow, that must be one of the coolest jobs ever! How neat!! So good to see a company taking good care of it’s employees! Wow! What an awesome job you have. and great writing talent as well. What a fun job! Would be a cool experience to take a tour! What a great opportunity to visit Pixar. What a fun place! Now I must go. Thanks for letting me in on the concept art for monster’s university! Lucky you that sounds like an amazing experience. Thanks for the review.